[Rockman Gallery, New York]; Julius S. Held, Old Bennington, VT; Alexis Ford Audette, 1983; NGA purchase, 1983. Selections from the Drawing Collection of Mr. and Mrs. Julius S. Held, University Art Gallery, Binghamton; traveling exhibition, 1970, no. 141. The Age of Vasari, University of Notre Dame Art Gallery, South Bend, IN, and University Art Gallery, State University of New York at Binghamton, 1970, no. D29. Master Drawings from the Collection of Ingrid and Julius S. Held, The Sterling and Francine Clark Art Institute, Williamstown; traveling exhibition, 1979, no. 3. Julius S. Held, Drawings from His Collection, Miriam and Ira D. Wallach Art Gallery, Columbia University, New York, 1990, no. 64 (xeroxed checklist). 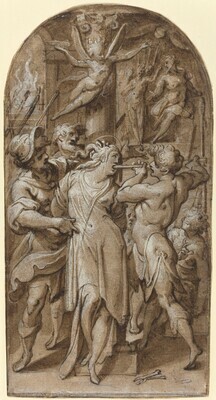 From Studio to Studiolo, Florentine Draftsmanship under the First Medici Grand Dukes, Allen Memorial Art Museum, Oberlin College; Bowdoin College Museum of Art; Hood Museum of Art, Dartmouth College, 1991-1992, no. 59 (not exhibited at Dartmouth). Pillsbury, Edmund. "Drawing by Jacopo Zucchi." Master Drawings 12, no. 1 (Spring, 1974): 15, 29 note 54, pl.15a.